For more information about this Proven Safety Countermeasure, visit the Office of Safety's Road Diet website. A "Road Diet," or roadway reconfiguration, can improve safety, calm traffic, provide better mobility and access for all road users, and enhance overall quality of life. Source: Evaluation of Lane Reduction "Road Diet" Measures on Crashes, FHWA-HRT-10-053. A Road Diet typically involves converting an existing four-lane undivided roadway to a three-lane roadway consisting of two through lanes and a center two-way left-turn lane (TWLTL). Reduction of rear-end and left-turn crashes due to the dedicated left-turn lane. Reduced right-angle crashes as side street motorists cross three versus four travel lanes. Fewer lanes for pedestrians to cross. Opportunity to install pedestrian refuge islands, bicycle lanes, on-street parking, or transit stops. Traffic calming and more consistent speeds. A more community-focused, "Complete Streets" environment that better accommodates the needs of all road users. 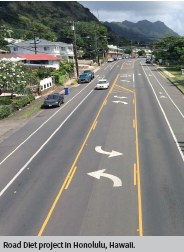 A Road Diet can be a low-cost safety solution when planned in conjunction with a simple pavement overlay, and the reconfiguration can be accomplished at no additional cost.